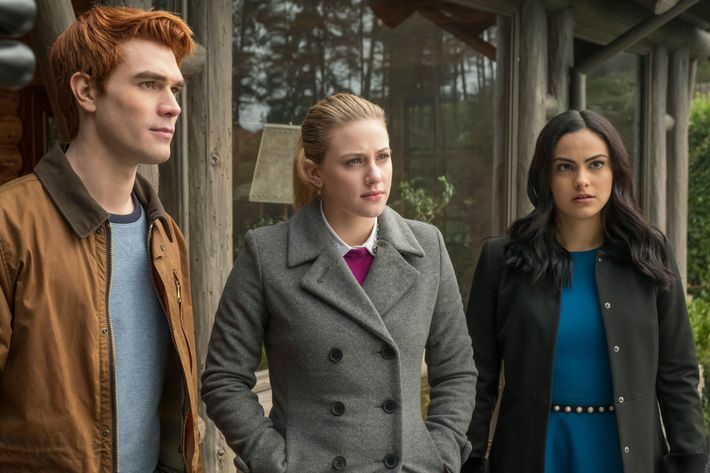 Riverdale season 2 has ended and it is completely tragic, yet also completely well-timed. I first binge-watched season 1 of the show last summer, but I've been watching this season weekly while they aired. This season was more in depth than the last season, but also slightly more unfocused. I will give it to them that this was their first season with 22 whole episodes, so maybe they were working out the bugs of how to fill all the episodes, because I'm sure that's difficult. There were just a few character arcs that I would have liked to seen more of and others that were so minimal that I wish they didn't exist at all. Overall though, the show was different enough each week with a lot of great anticipation that I kept watching and loving the characters and their stories. 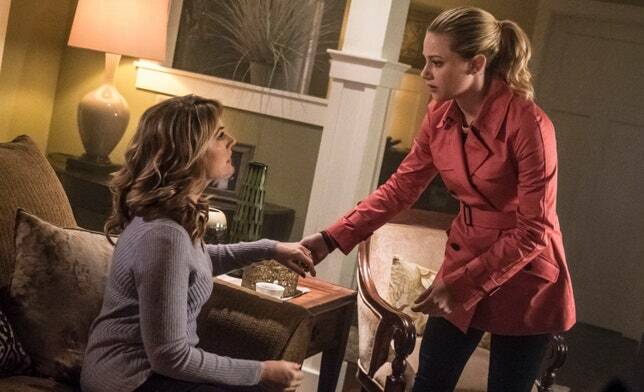 Thinking about the finale, I think Polly has the "darkness" that was in Hal and Betty. It creeps me out in general whenever she talks about what she has learned at the farm, because I'm 99% sure that it really is just a cult. Polly has been brainwashed and I think it is just feeding the "darkness" that is genetically inside her. Also, I have a crackpot theory this is the link where Riverdale could potentially crossover with Chilling Adventures of Sabrina: that is, it would have if Sabrina wasn't coming out through Netflix. I'm not really sure what it going on there and how I feel about that. Speaking of "darkness" though, where exactly is Hal? We saw him get arrested which is all fine and well, but then we see him talk to Betty through a clear all encompassing wall thing. Clearly, he is not in a normal prison cell, because we've seen those on the show before and they do not look like that. But is he in an advanced cell for psychopaths? Is he in an insane asylum? Biggest question in preparation for the new season- is he going to be moved to the prison being built on the south side? One of my favorite things about the finale was when Archie confronted Hiram in his own house. That was so beautiful. All season, Archie has been acting like a stupid puppy tailing Hiram everywhere, so to see him finally stand up against Hiram- albeit in an idiotic way- was fantastic. That scene peters out in the end (I wish Archie had done something more than just stab the desk) but CLEARLY there was a larger ramification to that interaction. Hence, why it was slightly idiotic. Archie has done Hiram's bidding all season, pisses him off at the end of it, and thinks that there were going to be no consequences for that? The tricky thing with the arrest at the end of the finale is that Andre, the actual killer, is dead. There were no other witnesses either, so there is no way to tangibly prove Archie's innocence. But this also means that evidence would have needed to be fabricated by Hiram right? So I think all they really need to do is prove the evidence to be false in order to get Archie released. Kevin had a really interesting story this season, but I wish they had put just a little more time into it because it felt very disjointed at times. He had the whole thing about finding hook-ups online, and then there was a maybe thing with Fang (so I thought), and over everything there's Moose. But it was just sprinkled in when it was convenient and I think his character could really benefit from being a larger focus in the story. I want to see more of how his life is and what the dynamic is between him and his father and what he does when Betty, Archie, Veronica, and Jughead are always running around like the Scooby gang. 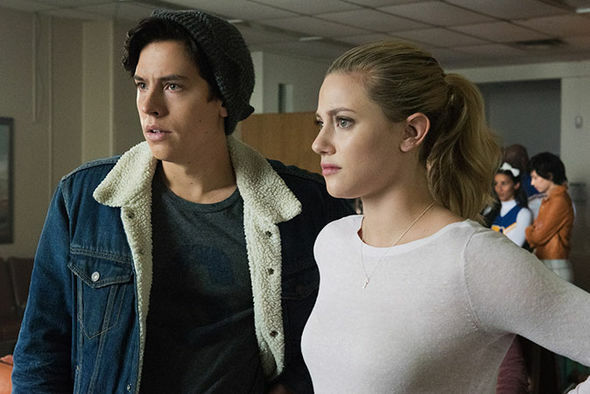 What Riverdale added to this season was the musical episode. I enjoyed the Carrie episode a lot. It was still relevant to the whole season while also being more entertaining and confronting so much of what needed to get pushed along in terms of character development and growth. I am not entirely sure though that this would work again as another musical episode. If they were to try to do this, I think they would need to place it in a very similar spot in season 3 that they did season 2 because then it would echo another spring show within the show. It can't be random or it won't carry over well. In general, the music of Riverdale was SO GREAT. I loved so many of the song choices they had playing in the background of the show. This may not really be something that most people pay attention to while watching something, but I definitely notice it, and not only did the songs fit the events that were happening, but they were also I think just great songs. I am definitely planning on putting together a Spotify playlist for the songs from this season. Along the same note of the music in the show, I really want there to be more of Josie and the Pussycats. I want the band to get back together, I want to hear more of their singing, and I want that to come back to Riverdale. I love their voices and the covers and songs that they perform and it killed me inside just a little that they weren't a thing in this season. I believe they will be coming back though, especially considering the comment Josie made in the finale about getting back to music. Last big thing: Jughead and the Serpents. I love how Jughead is the king of the Serpents now and then he asked Betty to be the queen!!!!! I am really interested to see where the gang goes moving in the future with the consolidation of the two sides/ larger divide of south (with the Ghoulies now though) and the north (old Riverdale north + the Serpents). What I'm really really curious about is how many of the "northside" kids from the high school are going to join the Serpents and how is Jughead going to run the gang. This is all only part of what I want to talk about, but the rest of it has to do with the characters and their relationships specifically and this post is already long enough, so I'll just make a separate post about the ships later and link it here when it is done. Season 2 was really great and I hope the creators of the show keep learning and producing amazing work so that season 3 is a fantastic as I think it will be!